Each resident spends two rotations dedicated solely to performing peripheral nerve blocks and catheters. We have full-time regional anesthesia nurse support whose role is to assist the regional service with patient positioning, charting and stocking equipment, allowing the resident to focus on performing procedures. While we do have a Regional Anesthesia Fellowship, residents perform all nerve block procedures, and the regional fellows and attendings function as teachers. Each resident far exceeds the minimum number of nerve blocks required by the ACGME. 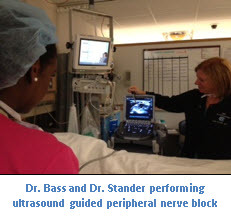 Upon leaving UNC, our graduates often feel like the experts in ultrasound-guided regional anesthesia in their respective practices. Many of our residents choose to take advantage of the regional anesthesia fellowship offered at UNC .